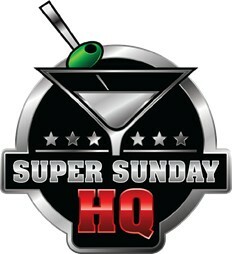 No one, but Super Sunday HQ, can say they’ve been to the last 8 Maxim Super Bowl Parties AND been to 3 Karma International-Produced MAXIM Parties in the last 12 Months (Super Bowl, Hot 100, Halloween). With amazing celebs, incredible atmosphere, gorgeous social media models, and top-notch performers, Karma International has consistently proven to us that it knows how to throw an over-the-top, fun party. 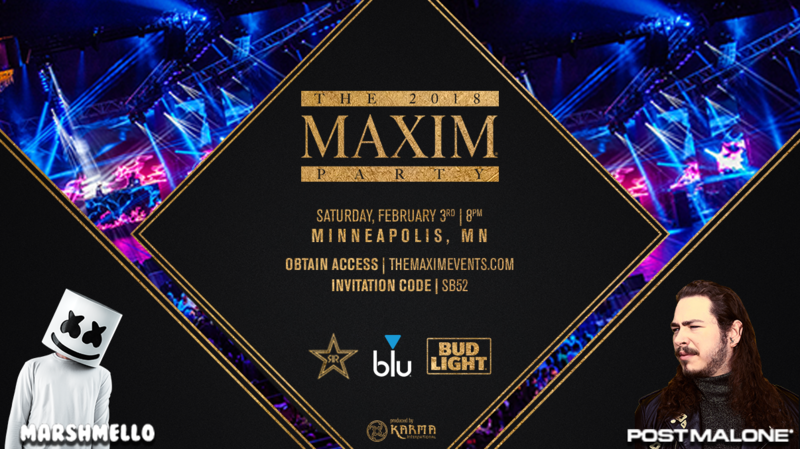 In 2018, the Maxim Party produced by Karma International will once again be the #1 most anticipated party, raising the bar during this milestone weekend of sports and over-the-top events in Downtown Minneapolis, Minnesota on February 3rd, 2018. Hosted at the Maxim Dome, a 31,000 sq ft, 360 immersive projection dome experience, the production aesthetic will surely blow minds. 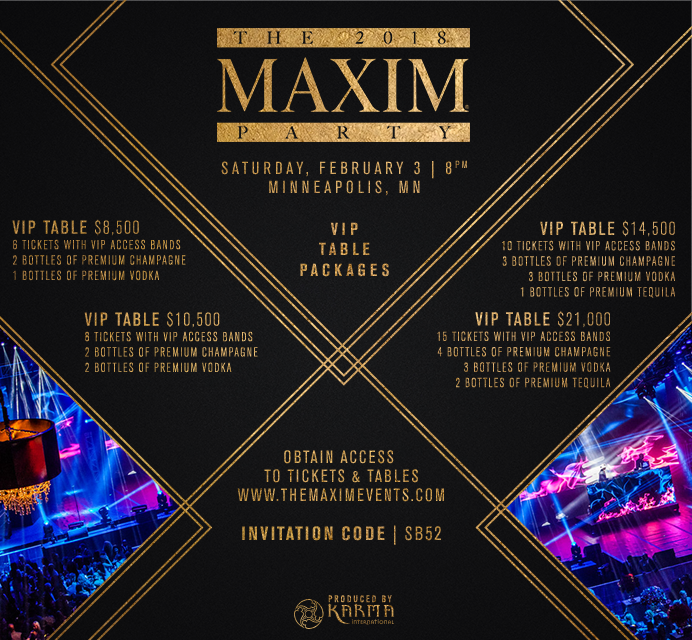 Art, fashion, music, and sports will collide for the ultimate party experience with multiple interactive areas, live artistic vignettes, celebrity music performances by American rapper Post Malone and DJ Marshmello, a 360 degree video projection experience, theatrical lighting, concert level sound, and several unique activations. Post Malone, an American rapper and musician is best known for his US Billboard Hot 100 single “Rockstar” and chart topper “White Iverson”. 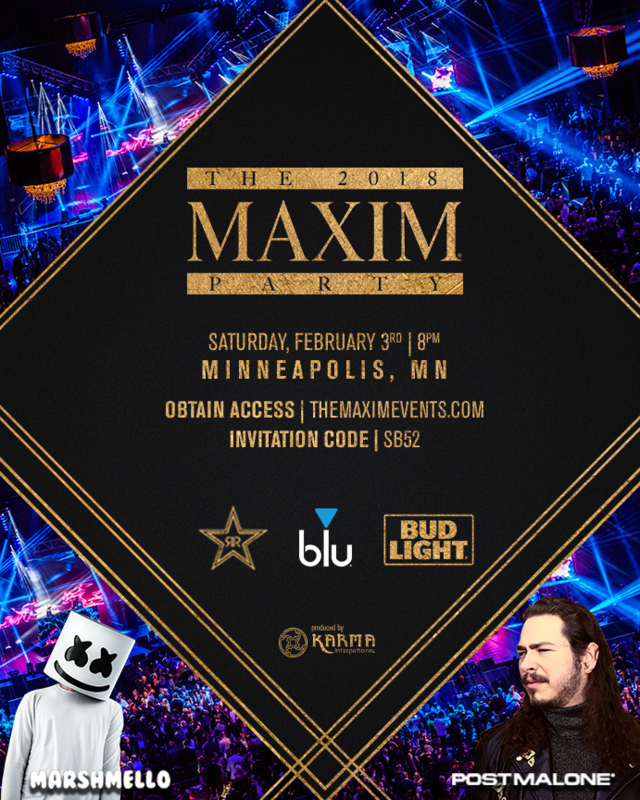 Additionally, we have world renown EDM producer and DJ, Marshmello, to perform many of his collaboration hits by Jack U, Zedd, Selena Gomez, and more. Additional special performances to be announced. Expect A-List Celebrities, VIPs, tastemakers and athletes. There’s only one Super Bowl 52 weekend in Minneapolis Minnesota. Don’t make the mistake of going cheap with one of the many questionable “Eventbrite” parties out there. If this sounds fun to you, then splurge, go for it now, before tables & tickets sell out or increase in price (originally $750). Think you have what it takes to be a Maxim Model? For a limited time, Karma International is accepting applications for “sponsored tickets” for qualifying people. Click the image above to learn more!